Things may change in the next few weeks, but as yet the off-field problems at Northampton Town have had no direct impact on the playing squad or their preparations for games. This week has seen the proposed takeover of the Cobblers by an Indian consortium fall through, the Borough Council demand repayment of a £10.25m loan, and HMRC issue a winding-up petition for an unpaid tax bill. The off-field problems are mounting, as is the pressure on beleagured chairman David Cardoza, but forward Sam Hoskins insists that it has at least been business as usual for the playing squad. “As players you just have to get on and do your job on the pitch,” said Hoskins when asked if the financial uncertainty around Sixfields had affected the dressing room. “We have to let whoever is dealing with off-field issues get on and do that. “We are focusing on the games as they come, and aren’t letting it affect us. The next challenge facing the players is a trip to underachieving Cambridge United. 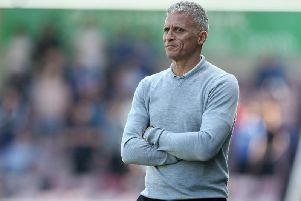 More than 1,000 Cobblers fans are set to make the trip across the county border to back the team tomorrow, and Hoskins echoed his manager Chris Wilder’s praise for the club’s supporters. The former Yeovil man admits he has been surprised by the size of the Cobblers’ fanbase, and says the players really appreciate their backing. “I had only played Northampton once before I joined, but the fans home and away are brilliant, you can’t fault them,” said the 22-year-old. “It is incredible the amount of fans that make the journeys all over the country.